THE names of the seven chosen on the suggestion of the Apostles raises very naturally the question, To what office were they appointed? Did the seven elected on this occasion represent the first beginning of that office of deacon which is regarded as the third rank in the Church, bishops being first, and presbyters or priests second. It is agreed by all parties that the title of deacon is not given to them in the sixth chapter of the Acts, and yet such an unprejudiced and fair authority as Bishop Lightfoot, in his Essay on the Christian Ministry, maintains that the persons selected and ordained at this crisis constituted the first origin of the diaconate as it is now known.120 The Seven are not called, either here or wherever else they are mentioned in the Acts, by the name of deacons, though the word διακονεῖν (serve), which cannot be exactly rendered into English, as the noun deacon has no equivalent verb answering to it, is applied to the duties assigned to them. But all the best critics are agreed that the ordination of the Seven was the occasion of the rise of a new order and a new office in the Church, whose work dealt more especially with the secular side of the ministerial function. The great German critic, Meyer, commenting on this sixth chapter, puts it well, though not so clearly as we should like. "From the first regular overseership of alms, the mode of appointment to which could not but regulate analogically the practice of the Church, was gradually developed the diaconate, which subsequently underwent further elaboration." This statement is somewhat obscure, and thoroughly after the manner of a German critic; let us develop it a little, and see what the process was whereby the distributers of alms to the widows of the earliest Church organisation became the officials of whom St. Laurence of Rome in the third, and St. Athanasius of Alexandria in the fourth century were such eminent examples. Now seeing that the force of tradition was so great as to compel even an anti-Jewish sect to call their meeting-houses by a Jewish name, we may be sure that the tradition of the institutions, forms, and arrangements of the synagogue must have been infinitely more potent with the earliest Christian believers, constraining them to adopt similar institutions in their own assemblies. Human nature is always the same, and the example of our own colonists sheds light upon the course of Church development in Palestine. When the Pilgrim Fathers went to America, they reproduced the English constitution and the English laws in that country with so much precision and accuracy that the expositions of law produced by American lawyers are studied with great respect in England. The American colonists reproduced the institutions and laws with which they were familiar, modifying them merely to suit their own peculiar circumstances; and so has it been all the world over wherever the Anglo-Saxon race has settled—they have done exactly the same thing. They have established states and governments modelled after the type of England, and not of France or Russia. So was it with the early Christians. Human nature compelled them to fall back upon their first experience, and to develop under a Christian shape the institutions of the synagogue under which they had been trained. And now, when we read the Acts, we see that here lies the most natural explanation of the course of history, and specially of this sixth chapter. In the synagogue, as Dr. John Lightfoot expounds it in his "Horae Hebraicae," (Mt 4:23) the government was in the hands of the ruler and the council of elders or presbyters, while under them there were three almoners or deacons, who served in the same capacity as the Seven in superintending the charitable work of the congregation. The great work for which the Seven were appointed was distribution, and we shall see that this was ever maintained, and is still maintained, as the leading idea of the diaconate, though other and more directly spiritual work was at once added to their functions by St. Stephen and St. Philip.122 Now, just as our colonists brought English institutions and ideas with them wherever they settled, so was it with the missionaries who went forth from the Mother Church of Jerusalem. They carried the ideas and institutions with them which had been there sanctioned by the Apostles, and thus we find deacons mentioned in conjunction with bishops at Philippi, deacons joined with bishops in St. Paul’s Epistle to Timothy, and the existence of the institution at Corinth, and its special work as a charitable organisation, implied in the description given of Phoebe to the Roman Christians in the sixteenth chapter of the Epistle to the Romans. St. Paul’s directions to Timothy in the third chapter of his first Epistle deal both with deacons and deaconesses, and in each case lay down qualifications specially suited for distributers of charitable relief, whose duty called upon them to visit from house to house, but say nothing about any higher work. They are indeed "to hold the mystery of the faith in a pure conscience; " they must be sound in the faith like the Seven themselves; but the special qualifications demanded by St. Paul are those needed in almoners: "The deacons must be grave, not double-tongued, not given to much wine, not greedy of filthy lucre." So far as to the testimony of Scripture. When we pass beyond the bounds of the canonical books, and come to the apostolic fathers, the evidence is equally clear. They testify to the universality of the institution, and bear witness to its work of distribution. Clement of Rome was a contemporary of the Apostles. He wrote an Epistle to the Corinthians, which is the earliest witness to the existence of St. Paul’s Epistles to the same Church. In Clement’s epistle we find express mention of deacons, of their apostolic appointment, and of the universal diffusion of the office. In the forty-third chapter of his epistle Clement writes to the Corinthians concerning the Apostles:—"Thus preaching through countries and cities they appointed bishops and deacons for those who should afterwards believe," clearly implying that deacons then existed at Rome, though we have no express notice of them in the epistle written by St. Paul to the Roman Church. There is a rule, however, very needful for historical investigations. Silence is no conclusive argument against an alleged fact, unless there be silence where, if the alleged fact had existed, it must have been mentioned. Josephus, for instance, is silent about Christ and Christianity. Yet he wrote when its existence was a matter of common notoriety. But there was no necessity for him to notice it. It was an awkward fact too, and so he is silent. St. Paul does not mention deacons as existing at Rome, though he does mention them at Philippi. But Clement’s words expressly assert that universally, in all cities and countries, this order was established wherever the Apostles taught; and so we find it even from Pagan records. Pliny’s letter to Trajan, written about A.D. 110, some fifteen or twenty years later than Clement, testifies that the order of deacons existed in far distant Bithynia, among the Christians of the Dispersion to whom St. Peter directed his Epistle. Pliny’s words are, "I therefore thought it the more necessary, in order to ascertain what truth there was in this account, to examine two slave-girls who were called deaconesses (ministrae), and even to use torture." (See the article Trajanus in the "Dict. Christ. Biog.," 4:1040.) It is exactly the same with St. Ignatius in the second chapter of his Epistle to the Trallians, which dates about the same period. The spiritual side of the office had now come more prominently into notice, as the occasion of their first appointment had fallen into disuse; but still Ignatius recognises the origin of the diaconate when he writes that "the deacons are not deacons of meats and drinks, but servants of the Church of God" (Lightfoot, "Apost. Fathers," vol 2. sec. 1. p. 156). While again Polycarp, in his Epistle to the Philippians, ch. 5., recognises the same qualities as necessary to deacons which St. Paul requires and enumerates in his Epistle to Timothy. Justin Martyr, a little later, twenty years or so, tells us that the deacons distributed the elements consecrated in the Holy Communion to the believers that were absent (Justin, "First Apol.," ch. 67.). This is most important testimony, connecting the order of deacons as then flourishing at Rome and their work with the Seven constituted by the Apostle. The daily distribution of the Apostles’ time was closely connected with the celebration of the Eucharist, which indeed in its meal or food, common to all the faithful, and its charitable collections and oblations, of which Justin Martyr speaks, retained still some trace of the daily distribution which prevailed in the early church, and occasioned the choice of the Seven. The deacons in Justin Martyr’s day distributed the spiritual food to the faithful, just as in earlier times they distributed all the sustenance which the faithful required, whether in their spiritual or their temporal aspect. It is evident from this recital of the places where the deacons are incidentally referred to, that their origin was never forgotten, and that distribution of charitable relief and help was always retained as the essence, the central idea and notion, of the office of deacon, though at the same time other and larger functions were by degrees entrusted to them, as the Church grew and increased, and ecclesiastical life and wants became more involved and complex.123 History bears out this view. Irenaeus was the disciple of Polycarp, and must have known many apostolic men, men who had companied with the Apostles and knew the whole detail of primitive Church government; and Irenaeus, speaking of Nicolas the proselyte of Antioch, describes him as "one of the seven who were first ordained to the diaconate by the Apostles." Now Irenaeus is one of our great witnesses for the authenticity of the Four Gospels; surely then he must be an equally good witness to the origin of the order of deacons and the existence of the Acts of the Apostles which is implied in this reference. It is scarcely necessary to go farther in Church history, but the lower one goes the more clearly we shall see that the original notion of the diaconate is never forgotten. In the third century we find that there were still only seven deacons in Rome, though there were forty-six presbyters, a number which was retained down to the twelfth century in the seven cardinal deacons of that Church.124 The touching story of the martyrdom of St. Laurence, Archdeacon of Rome in the middle of the third century, shows that he was roasted over a slow fire in order to extort the vast sums he was supposed to have in charge for the purpose of relieving the sick and the poor connected with the Roman Church; proving that the original conception of the office as an executive and charitable organisation was then vigorously retained; just as it is still set forth in the ordinal of the Church of England, where, after reciting how the deacon’s office is to help the priest in several subordinate positions, it goes on to say, "Furthermore, it is his office, where provision is so made, to search for the sick, poor, and impotent people of the parish, to intimate their estates, names, and places where they dwell, unto the curate, that by his exhortation they may be relieved by the alms of the parishioners." The only objection of any value which has been raised to this line of argument is based on a mere assumption. It has been said that the Seven were appointed for a special emergency, and to serve a temporary purpose connected with the community of goods which existed in the early Church of Jerusalem, and therefore when this arrangement ceased the office itself ceased also. But this argument is based on the assumption that the Christian idea of a community of goods wholly passed away, so that services of an order like the Seven were no longer required. This is a pure assumption. The community of goods as practised at Jerusalem was found by experience to be a mistake. The shape of the idea was changed, but the idea itself survived. The old form of community of goods passed away. The Christians retained their rights of private property, but were taught to regard this private property as in a sense common, and liable for all the wants and needs of their poor and suffering brethren. A charitable order, or at least an order charged with the care of the poor, and their relief, must inevitably have sprung up among the Jewish Christians. The relief of the poor was a necessary part of the duty of a synagogue. The Jewish domestic law enforced a poor-rate, and collected it through the organisation of each synagogue, by means of three deacons attached to each. Selden, in his great work on "The Laws of the Hebrews," bk. 2. chap. 6. ("Works," 1:632), tells us that if "any Jew did not pay his fair contribution he was punished with stripes." As soon as the Jewish Christians began to organise themselves, the idea of almoners, with their daily and weekly distributions, after the synagogue model, was necessarily developed.125 We have an unexceptionable piece of evidence upon this point. The satirist Lucian lived at the close of the second century. He was a bitter scoffer, who jeered at every form of religion, and at Christianity above all. He wrote an account of a certain Syrian named Peregrinus Proteus, who was an impostor trading upon the religious principles of various philosophical sects, and specially on those of the Christians. Lucian tells us that the Christians were the easiest persons to be deceived, because of their opinions. Lucian’s words are interesting as showing what a second-century pagan, a clever literary man too, thought of Christianity, viewing it from the outside. For this reason we shall quote a little more than the words which immediately bear upon the subject. "It is incredible with what alacrity these people (the Christians) support and defend the public cause. They spare nothing, in fact, to promote it. These poor men have persuaded themselves that they shall be immortal, and live for ever. They despise death therefore, and offer up their lives a voluntary sacrifice, being taught by their lawgiver that they are all brethren, and that, quitting our Grecian gods, they must worship their own sophist, who was crucified, and live in obedience to His laws. In compliance with them, they look with contempt upon all worldly treasures, and hold everything in common—a maxim which they have adopted without any reason or foundation. If any cunning impostor, therefore, who knows how to manage matters, come amongst them, he soon grows rich by imposing on the credulity of those weak and foolish men." We can see here that the great outer world of paganism considered a community of goods as still prevailing among the Christians. Their boundless liberality, their intense devotion to the cause of their suffering brethren, proved this, and therefore, because a practical community of goods existed amongst them, an order of men was required to superintend the distribution of their liberality in the second century just as tru1y as the work of the Seven was needed in the Church of Jerusalem. Here indeed, as in so many other cases, the Church of Christ needs to go back to scriptural example and to apostolic rule. We require for the work of the Church deacons like the primitive men who devoted their whole lives to this one object; made it the subject of their thoughts, their cares, their studies, how they might instruct the ignorant, relieve the poor and widows, comfort the prisoners, sustain the martyrs in their last supreme hour; and who, thus using well the office of a deacon, found in it a sufficient scope for their efforts and a sufficient reward for their exertions, because they thereby purchased for themselves a good degree and great boldness in the faith of Jesus Christ. The Church now requires the help of living agencies in vast numbers, and they are not forthcoming. Let her avail herself of apostolic resources, and fall back upon primitive precedents. The real diaconate should be revived. Godly and spiritual men should be called upon to do their duty. Deacons should be ordained without being called to give up their ordinary employments. Work which now unduly accumulates upon overburdened shoulders should be assigned to others suitably to their talents, and thus a twofold blessing would be secured. Christian life would flourish more abundantly, and many a rent and schism, the simple result of energies repressed and unemployed, would be destroyed in their very commencement. We have devoted much of our space to this subject, because it is one of great interest, as touching the origin and authority of the Christian ministry, and also because it has been a subject much debated; but we must hurry on to other points connected with the first appointment of the diaconate. The people selected the person to be ordained to this work. It is probable that they made their choice out of the different classes composing the Christian community. The mode of election of the Seven, and the qualifications laid down by the Apostles, were derived from the synagogue. Thus we read in Kitto’s "Cyclopaedia," art. "Synagogue:"—"The greatest care was taken by the rulers of the synagogue and of the congregation that those elected almoners should be men of modesty, wisdom, justice, and have the confidence of the people. They had to be elected by the harmonious voice of the people." Seven deacons altogether were chosen. Three were probably Hebrew Christians, three Grecian Christians or Hellenists, and one a representative of the proselytes, Nicolas of Antioch. This would have been but natural. 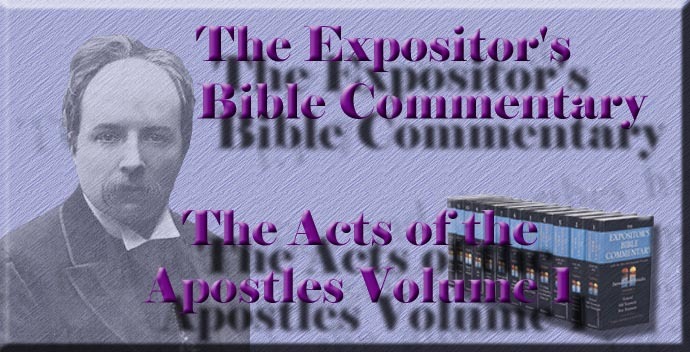 The Apostles wanted to get rid of murmurs, jealousies, and divisions in the Church, and in no way could this have been more effectually done than by the principle of representation. Had the Seven been all selected from one class alone, divisions and jealousies would have prevailed as of old. The Apostles themselves had proved this. They were all Hebrew Christians. Their position and authority might have secured them from blame. Yet murmurings had arisen against them as distributers, and so they devised another plan, which, to have been successful, as it doubtless was, must have proceeded on a different principle. Then when the seven wise and prudent men were chosen from the various classes, the Apostles asserted their supreme position: "When the Apostles had prayed, they laid their hands on them." And as the result peace descended like a shower upon the Church, and spiritual prosperity followed upon internal peace and union. III "They laid their hands on them." This statement sets forth the external expression and the visible channel of the ordination to their office which the Apostles conferred. This action of the imposition of hands was of frequent use among the ancient Jews. The Apostles, as well acquainted with Old Testament history, must have remembered that it was employed in the case of designation of Joshua as the leader of Israel in the place of Nu 27:18-23; (compare De 34:9) that it was used even in the synagogue in the appointment of Jewish rabbis, and had been sanctioned by the practice of Jesus Christ. The Apostles naturally therefore, used this symbol upon the solemn appointment of the first deacons, and the same ceremonial was repeated upon similar occasions. Paul and Barnabas were set apart at Antioch for their missionary work by the imposition of hands. St. Paul uses the strongest language about the ceremony. He does not hesitate to attribute to it a certain sacramental force and efficacy, bidding Timothy "stir up the gift of God which is in thee through the laying on of my hands"; (2Ti 1:6) while again, when we come down a few years later, we find the "laying on of hands" reckoned as one of the fundamental elements of religion, in the sixth chapter of the Epistle to the Hebrews. But it was not merely in the solemn appointment of officials in the Church that this ceremony found place. It was employed by the Apostles as the rite which filled up and perfected the baptism which had been administered by others. Philip baptised the Samaritans. Peter and John laid their hands tin them and they received the Holy Ghost. The ceremony of imposition of hands was so essential and distinguishing a point that Simon Magus selects it as the one he desires above all others effectually to purchase, so that the outward symbol might be followed by the inward grace. "Give me also this power, that on whomsoever I lay my hands, he may receive the Holy Ghost," was the prayer of the arch-heretic to St. Peter; while again in the nineteenth chapter we find St. Paul using the same visible ceremony in the case of St. John’s disciples, who were first baptised with Christian baptism, and then endued by St. Paul with the gift of the Spirit. Imposition of hands in the case of ordination is a natural symbol, indicative of the transmission of function and authority. It fitly indicates and notifies to the whole Church the persons who have been ordained, and therefore has ever been regarded as a necessary part of ordination. St. Jerome, who was a very keen critic as well as a close student of the Divine oracles, fixes upon this public and solemn designation as a sufficient explanation and justification of the imposition of hands in ordinations, test any one should be ordained without his knowledge by a silent and solitary prayer. Hence every branch of the Church of Christ has rigorously insisted upon imposition of hands after the apostolic example, in the case of ordinations to official positions, with one or two apparent and very doubtful exceptions, which merely prove the binding character of the rule. IV The list of names again is full of profit and of warning. How completely different from human histories, for instance, is this Divine record of the first doings of the Church! How thoroughly shaped after the Divine model is this catalogue of the earliest officials chosen by the Apostles! Men have speculated whether they were Hebrews or Grecians, whether they belonged to the seventy sent forth by Christ or to the hundred and twenty who first gathered into the upper room at Jerusalem. All such speculations are curious and interesting, but they have nothing to do with man’s salvation; therefore they are sternly put on one side and out of sight. How we should long to know the subsequent history of these men, and to trace their careers! yet Holy Writ tells us but very little about them, nothing certain, in fact, save what we learn about St. Stephen and St. Philip. God bestowed Holy Scripture upon men, not to satisfy or minister to their curiosity, but to nourish their souls and edify their spirits. And surely no lesson is more needed than the one implied in the silences of this passage; there is in truth none more necessary for our publicity-seeking and popularity-hunting age than this, that God’s holiest servants have laboured in obscurity, have done their best work in secret, and have looked to God alone and to His judgment for their reward. I have said indeed that concerning the list of names recorded as those of the first deacons, we know nothing but of St. Stephen and St. Philip, whose careers will again come under our notice in later chapters. There is, however, a current tradition that Nicolas, the proselyte of Antioch, did distinguish himself, but in an unhappy direction. It is asserted by Irenaeus in his work "Against Heresies" (Book 1. chap. 26), that Nicolas was the founder of the sect of Nicolaitans denounced in the Revelation of St. John. (Re 2:6,16) Critics are, however, much divided upon this point. Some clear Nicolas of this charge, while others uphold it. It is indeed impossible to determine this matter. But supposing that Nicolas of Antioch was the author of this heresy, which was of an antinomian character, like so many of the earliest heresies that distracted the primitive Church, this circumstance would teach us an instructive lesson. Just as there was a Judas Iscariot among the Apostles, and a Demas among St. Paul’s most intimate disciples, so was there a Nicolas among the first deacons. No place is so holy, no office so sacred, no privileges so great, but that the tempter can make his way there. He can lurk unseen and unsuspected amid the pillars of the temple, and he can find us out, as he did the Son of God Himself, amid the wilds of the desert. Official position and exalted privileges confer no immunity from temptation. Nay, rather, they bring with them additional temptations over and above those which assail the ordinary Christian, and should therefore lead every one called to any similar work to diligent watchfulness, to earnest prayer, lest while teaching others they themselves fall into condemnation. There is, however, another lesson which a different version of the history of Nicolas would teach. Clement of Alexandria, in his celebrated work called the "Stromata" (Book 2. chap. 20, and Book 3. chap. 4), tells us that Nicolas was a most strictly virtuous man. He was extreme even in his asceticism, and, like many ascetics, used language that might be easily abused to the purposes of wickedness. He was wont to say that the "flesh must be abused," meaning that it must be chastised and restrained. One-sided and extreme teaching is easily perverted by the wicked nature of man, and men of impure lives, listening to the language of Nicolas, interpreted his words as an excuse for abusing the flesh by plunging into the depths of immorality and crime. Men placed in official positions and called to the exercise of the clerical office should weigh their words. Extreme statements are bad unless duly and strictly guarded. The intention of the speaker may be good, and a man’s own life thoroughly consistent, but unbalanced teaching will fall upon ground where the life and intention of the teacher will have no power or influence, and bring forth evil fruit, as in the case of the Nicolaitans. V The central figure of this whole section of our narrative is St. Stephen. He is introduced into the narrative with the same startling suddenness which we may note in the case of Barnabas and of Elijah. He runs a rapid course, flings all, Apostles and every one else, into the shade for a time, and then disappears, exemplifying those fruitful sayings of inspiration, so true in our every-day experience of God’s dealings, "The first shall be last, and the last first." "Paul may plant, Apollos may water, but it is God alone that giveth the increase." Stephen, full of grace and power, did great signs and wonders among the people. These two words, grace and power, are closely connected. Their union in this passage is significant. It was not the intellect, or the eloquence, or the activity of St. Stephen which made him powerful among the people and crowned his labours with such success. It was his abundant grace. Eloquence and learning, active days and laborious nights, are good and necessary things. God uses them and demands them from His people. He chooses to use human agencies, and therefore demands that the human agents shall give Him of their best, and not offer to Him the blind and lame of their flock. But these things will be utterly useless and ineffective apart from Christ and the power of His grace. The Church of Christ is a supernatural society, and the work of Christ is a supernatural work, and in that work the grace of Christ is absolutely necessary to make any human gift or exertion effectual in carrying out His purposes of love and mercy. This is an age of organisations and committees and boards; and some good men are so wrapped up in them that they have no time to think of anything else. To this busy age these words, "Stephen, full of grace and power," convey a useful warning, teaching that the best organisations and schemes will be useless to produce Stephen’s power unless Stephen’s grace be found there as well. This passage is a prophecy and picture of the future in another aspect. The fulness of grace in Stephen wrought powerfully amongst the people. It was the savour of life unto life in some. But in others it was a savour of death unto death, and provoked them to evil deeds, for they suborned men "which said, We have heard him speak blasphemous words against Moses, and against God." We get in these words, in this false accusation, even through its falsehood, a glimpse into the character of St. Stephen’s preaching. A false accusation need not be necessarily altogether false. Perhaps rather we should say that, in order to be effective for mischief, a twisted, distorted charge, with some basis of truth, some semblance of justification about it, is the best for the accuser’s purpose, and the most difficult for the defendant to answer. St. Stephen was ripening for heaven more rapidly than the Apostles themselves. He was learning more rapidly than St. Peter himself the true spiritual meaning of the Christian scheme. He had taught in no ambiguous language the universal character of the Gospel and the catholic mission of the Church. He had expanded and applied the magnificent declarations of the Master Himself, "The hour cometh, when neither in this mountain, nor in Jerusalem, shall ye worship the Father"; "The hour cometh, and now is, when the true worshipper’s shall worship the Father in spirit and in truth." And then the narrow-minded Grecian Jews, anxious to vindicate their orthodoxy, which was doubted by their Hebrew brethren, distorted Stephen’s wider and grander conceptions into a charge of blasphemy against the holy man. What a picture of the future of Christ’s best and truest witnesses, especially when insisting on some nobler and wider or forgotten aspect of truth. Their teaching has been ever suspected, distorted, accused as blasphemous; and so it must ever be. And yet God’s servants, when they find themselves thus misrepresented, can realise to themselves that they are but following the course which the saints of every age have run, that they are being made like unto he image of Stephen the first martyr, and of Jesus Christ Himself, the King of Saints, who suffered under a similar accusation. The mere popularity-hunter will, of course, carefully eschew such charges and suspicions. His object is human praise and reward, and he shapes his teaching so as to carefully avoid giving offence. But then the mere popularity-hunter seeks his reward here below, and very often gets it. Stephen, however, and every true teacher looks not for reward in this world. Stephen taught truth as God revealed it to his soul. He suffered the consequence, and then received his crown from that Almighty Judge before whose awful tribunal he ever consciously stood. Misrepresentation must ever be expected by God’s true servants. It must be discounted, borne with patiently, taken as a trial of faith and patience, and then, in God’s own time, it will turn out to our greater blessing. One consideration alone ought to prove sufficient to console us under such circumstances. If our teaching was not proving injurious to his cause, the Evil One would not trouble himself about it. Let us only take good heed lest our own self-love and vanity should lead us to annoy ourselves too much about the slander or the evil report, remembering that misrepresentation and slander is ever the portion of God’s servants. Jesus Christ and Stephen were thus treated. St. Paul’s teaching was accused of tending to licentiousness; the earliest Christians were accused of vilest practices; St. Athanasius in his struggles for truth was accused of rebellion and murder; the Reformers were accused of lawlessness; John Wesley of Romanism and disloyalty; William Wilberforce of being an enemy to British trade; John Howard of being an encourager of crime and immorality. Let us be content then if our lot be with the saints, and our portion be that of the servants of the Most High. Again, we learn from this place how religious zeal can overthrow religion and work out the purposes of evil. Religious zeal, mere party spirit taking the place of real religion, led the Hellenists to suborn men and falsely accuse St. Stephen. They made an idol of the system of Judaism, and forgot its spirit. They worshipped their idol so much that they were ready to break the commandments of God for its sake. The dangers of party spirit in matters of religion, and the evil deeds which have been done in apparent zeal for God and real zeal for the devil, these are still the lessons, true for the future ages of the Church, which we read in this passage. And how true to life has even our own age found this prophetic picture. Men cannot indeed now suborn men and bring fatal charges against them in matters of religion, and yet they can fall into exactly the same crime. Party religion and party zeal lead men into precisely the same courses as they did in the days of St. Stephen. Partisanship causes them to violate all the laws of honour, of honesty, of Christian charity, imagining that they are thereby advancing the cause of Christ, forgetting that they are acting on the rule which the Scriptures repudiate, -they are doing evil that good may come, — and striving to further Christ’s kingdom by a violation of Hisfundamental precepts. Oh for more of the spirit of true charity, which will lead men to support their own views in a spirit of Christian love! Oh for more of that true grasp of Christianity which will teach that a breach of Christian charity is far worse than any amount of speculative error! The error, as we think it, may be in reality God’s own truth; but the violation of God’s law implied in such conduct as Stephen’s adversaries displayed, and as party zeal now often prompts, can never be otherwise than contrary to the mind and law of Jesus Christ. Bishop Lightfoot, commenting on Philippians, p. 186, says: "I have assumed that the office thus established represents the later diaconate; for though this point has been much disputed, I do not see how the identity of the two can reasonably be called in question. If the word deacon does not occur in the passage, yet the corresponding verb and substantive, διακονεῖν and διακονία, are repeated more than once. The functions, moreover, are substantially those which devolved on the deacons of the earliest ages, and which still in theory, though not altogether in practice, form the primary duties of the office. Again, it seems clear, from the emphasis with which St. Luke dwells on the new institution, that he looks on the establishment of this office, not as an isolated incident, but as the institution of a new order of things in the Church. It is, in short, one of those representative facts of which the earlier part of his narrative is almost wholly made up." See Le Bas and Waddington's Voyage Archéologique , vol. iii., p. 583, Inscriptions , No. 2558; and Dr. Salmon's article on Marcion in Smith's Dict. Christ. Biog. , iii., 819. There is one passage in the Epistles which shows that not merely the name but the organization of synagogues was adopted by the early Church. In 1 Cor. vi. 1 it is written, "Dare any of you, having a matter against his neighbour, go to law before the unrighteous, and not before the saints?" This verse cannot be rightly understood unless we remember that every synagogue had its own judicial tribunal, composed of ten men, who decided on Mondays and Thursdays every controversy among the Jews, inflicting immediate corporal punishment on the condemned. The Romans permitted and supported this domestic jurisdiction, just as the Turkish Empire, which has inherited so many of the Roman traditions, allows the Greek and other Eastern Churches to exercise jurisdiction over their own members in all questions touching religion, supporting their decisions by force if necessary. St. Paul, in this passage, wishes the members of the Christian synagogues to act like those of the Jewish, and avoid the scandal of Christians going to law with their brethren before pagans. Bishop Lightfoot, in his well-known Essay on the Christian Ministry, from which we have already quoted, does not admit any likeness between the office of the diaconate in the Church and any similar office in the synagogue. He refuses to recognise the Chazzan or sexton of the synagogue as in any sense typical of Christian deacons. But he has not noticed the three almoners or deacons attached to every synagogue, whom his seventeenth-century namesake, Dr. John Lightfoot, in his tract on synagogues ( Horæ Hebr. , St. Matt. iv. 23), considers the origin of the Christian deacons. The community of goods may have evolved itself naturally enough out of the celebration of the Eucharist. Just let us realize what must have happened, say, on the day of Pentecost and the few succeeding days. The Apostles seem to have been living a common life during the ten days of expectation. They dwelt in the house where the upper room was. The day after Pentecost there must have been a great deal to do, in prayer, baptism, and celebration of the Eucharist. Their converts would join with them in the eucharistic feast, from day to day celebrated after the primitive fashion at the end of a common meal. Some enthusiast may then have suggested that, as the Master might at any moment appear, they should always live and eat in common. After a time, as the numbers increased, this arrangement had to be modified, and a daily distribution was substituted for daily common meals. The community of goods may thus have been developed out of the spiritual feast of the Eucharist, which they took in common. When the daily distribution terminated by the exhaustion of the funds, the Agape or lovefeast took its place, remaining as a fragment or relic of the earlier custom. Pliny in his letter mentions the Agape, and rightly distinguishes it from the worship of the Christians which was celebrated in the early morning. "After these ceremonies they used to disperse, and assemble again to share a common meal of innocent food." In the twelfth century the number of cardinal deacons was fixed at fourteen, at which it has ever since remained. See Kitto's Biblical Cyclopædia , articles on Synagogue and Deacon, or Schaff's edition of Herzog's Cyclopædia , article on Synagogues. The College of Cardinals offers another illustration of this. The Cardinals were originally the parochial clergy of Rome. As Rome's ecclesiastical ambition increased, so did that of her parochial clergy, who came to imagine that, standing so close to the Pope, who was the door, they were themselves the hinges (cardines) on whom the door turned. I wonder if one of the original presbyters of Rome would be able to recognise his office in that of a modern cardinal claiming princely rank and precedence! I have expanded this subject in Ireland and the Celtic Church , ch. ii., viii., ix. ; and in Ireland and the Anglo-Norman Church , pp. 352-70.